We've all seen that one question in the diversity section of a standard questionnaire - "Do you consider yourself to have a disability?" Do I consider myself to have a disability?.........What a strange question to ask an individual. Consider myself.....does that mean that it's my choice to identify as disabled or perhaps are they asking whether you would be labelled as disabled by society? Perhaps being disabled is a state of mind whereas what how does that change when/if you become more/less disabled? How does that change your identity? What does it mean to be disabled? Does it really have a definition? So many questions are raised and the bridge between the labelling and self-identity of disability is something that I have been recently struggling with and I would love to share my thoughts with you. For the purpose of this blog, I am simply concentrating on physical disability as I have no experience of dealing with a mental impairment. I suppose the easiest question to answer is the definition of disabled. In the UK, we are fortunate enough to have the Equality Act of 2010, which defines a disabled person as someone with a mental or physical impairment that has a substantial and long-term negative effect on the person's ability to carry out normal day-to-day activities. Using that definition and my amputation as an example, I do have a physical difference. Is it really an impairment at my age and with my activity levels? The definition of impairment is something that is damaged or weakened so I suppose in some respect, having a prosthetic leg means you're slightly weaker than your able-bodied peers. Having said that, I am able to run, jump and do everything that my coworkers are able to do (if not more). Moving on to the next section of the definition - having a substantial (of considerable importance) and long-term negative effect. Although there's no arguing that creating stumpy was a long-term decision, it does not have an overall negative effect at all - surely it's about perspective. With the exception of having to put my leg on in the morning, my amputation has no substantial impact on my life. Making adaptions and changes in your life allows you to not let your difference have a negative effect on you so perhaps being adaptable makes you not disabled? In that case, why does society still label you as disabled? If you think about the imagery of disabled individuals, we immediately think of signs for toilets and at bus stops/train stations etc. 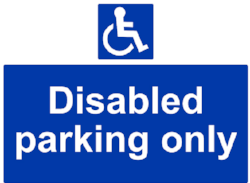 Disabled people are mostly depicted by a wheelchair symbol or a walking stick and strangely a large amount of pregnant women, so can we really blame the general public when they label you as disabled because that is how you are portrayed? I'm sure if you asked a child to draw a disabled person, they would immediately draw a wheelchair user but perhaps another main issue is with the word 'disabled' itself. It breaks down to dis-abled, which suggests that we are less able. Although that is true in some respects, aren't we all less able to do certain things? If a child isn't particularly good at football, they aren't called a disabled footballer but they would be pushed towards other sports. In my opinion, 'disability' is the same - although an individual may not be able to walk, they can be pushed towards other activities/life skills. Fortunately, I think the culture is changing in the way that the public see disability, largely due to the 2012 London Paralympics and I see that we are starting to move away from words like disabled, handicapped, paralysed, weakened and more towards adaptive and handi-capable. On the other hand, some people really like the label of 'disabled' as it is how they identify. There is no right or wrong answer with identity - it's simply how you feel. For me, I have been through many different challenges with my disabled identity. While I was in constant pain with my foot, however not a full-time wheelchair user, people would not see me as having a disability and I would feel pressure to identify as able-bodied, despite having this tiny, screaming Jamie inside. I struggled to receive help from schools, colleges, universities and organisations as I did not fit within their disabled label. When I then went into my wheelchair full-time, others were quick to label me as disabled and they would lower their expectations of my ability as I met with their expectation of their disabled label. Then again, people often struggled to accept and label me as disabled as I had a complicated disability where I wasn't able to walk however I wasn't paralysed and didn't have a disability that people expected. When I would stand out of my wheelchair (on one leg) to reach something, people were unable to understand that they would need to change the label that they had placed on me. We are not all the same and we cannot all fit one label. Once my amputation was performed and I was still using my wheelchair, people were even quicker to label me as disabled (even though I felt more able-bodied than before) simply because I had a more obvious disability and I fit in very well with their expectations. Now I am up and running, people will label me differently depending on how I walk, what I wear and how I present myself. If my prosthetic is not visible, people label me as able-bodied and it becomes very difficult when I use disabled spots for my car. I do feel very awkward using disabled spots because, although I need to use them for the space to get my leg out, I will often try and show a bit of prosthetic just to justify my need for the space. 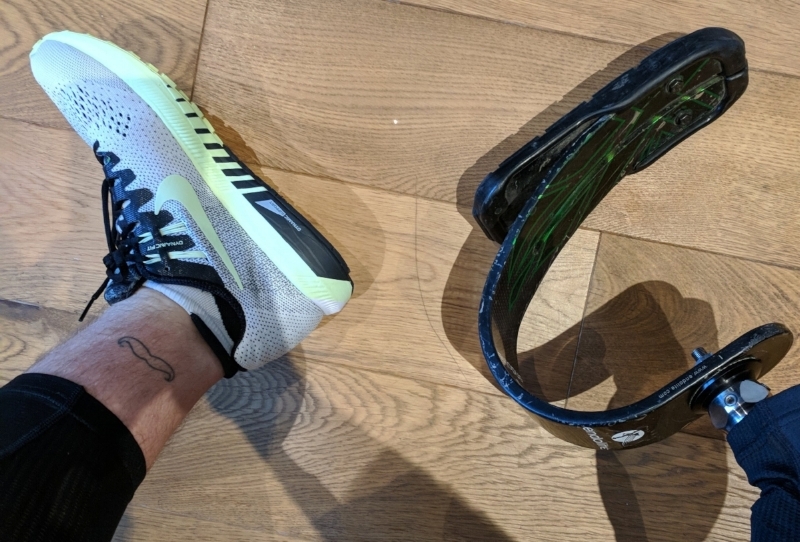 If I wear my running blade, people will see me as this hybrid disabled/superhero creature who is disabled but also incredibly cool and able to run - I kinda like this label. So on one hand, I need to identify as disabled to have the benefit of using disabled spaces but I am also incredibly able-bodied in other respects. Perhaps I have a good balance but the reality is that I don't know how I feel about my disabled identity. Perhaps I should identify as disabled, depending on how I am seen...but then it makes identity less of a choice and more of an expectation. Surely then identity and labels are the same thing...but then I suppose who really cares that much? With any identity, whether it be disabled, gay, straight, able-bodied or dinosaur, it's your choice and it comes in a spectrum. Identity can change from day-to-day, hour-to-hour and there's nothing wrong with that. Present how you like, self-identify as whatever/whoever you like and only pay attention to the labels that you give yourself. Do labels really matter? My mum owns a label maker so perhaps if they really do matter to you, i'll let you borrow hers.